The 13th race on the 2011 Formula 1 tour, the Italian Grand Prix on the historically fast Monza circuit. Racing on the 3.6 mile (5.793 kilometer), 11-turn road course, the long straights provide one of the best opportunities for the V-8 Formula 1 race engines to sing at high RPMs. Driving race cars wearing low-downforce packages, the 26 Formula 1 drivers and teams ready for Saturday's qualifying for what will be a 53-lap main event Sunday. Following the times produced in the previous 3 practice sessions at Monza, it was assumed the battle for top spot in Sunday's Italian Grand Prix would be between the Mercedes-Benz engines powering the McLarens and the force of Red Bull Racing featuring Renault power. Indeed, it was a tight battle between the McLaren F1 drivers of Lewis Hamilton and Jenson Button as well as Red Bull-Renault of the red hot Sebastian Vettel. Into the final round of qualifying, the McLaren-Mercedes cars launched to an early top time with Hamilton mustering the best effort with a 1 minute, 22.725 second lap. However, the undefeated force of Red Bull Racing in 2011 Formula 1 qualifying emerged with Sebastian Vettel in the late stage of the session. Crossing the line with a 1 minute, 22.275 second best lap, Vettel will start from pole position for the 10th time this season. The Monza race track has served as a significant staging place for the career of Sebastian Vettel. In 2008, racing as a lesser known driver for the Scuderia Toro Rosso team, the German driver Vettel delivered a major upset becoming the youngest driver to win a Formula 1 race. Since that very first win, the talented driver was upgraded to the Red Bull Racing team where he is currently making history by winning 16 additional grand prix races since 2009. Presented as the most regular rival to Red Bull Racing this season so far, McLaren-Mercedes once again starts close to that front with Hamilton starting alongside Vettel on the front row of the Italian Grand Prix. Jenson Button is place in the 3rd grid position with Fernando Alonso's Ferrari slotted in 4th. 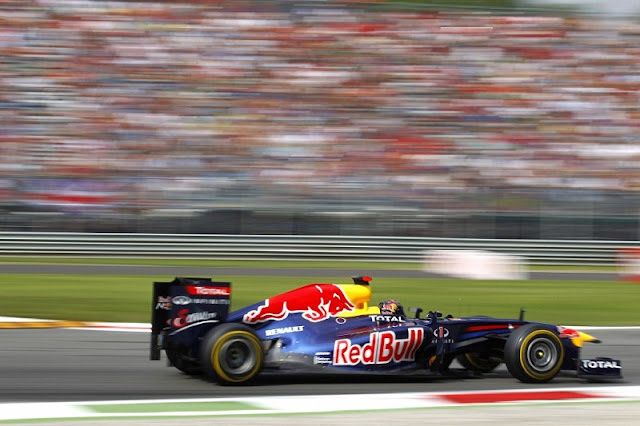 The second Red Bull-Renault car piloted by Sebastian Vettel will start 5th beside Felipe Massa's Ferrari. On the 4th row for the Italian Grand Prix, Lotus Renault GP's Vitaly Petrov collected his best qualifying result since the Spanish Grand Prix. Qualifying 8th, Schmacher has recently begun showing he is still the same driver who won 7 World Championships. In the last grand prix event in Belgium, the senior driver in the Mercedes GP team stormed from a 24th place start to cross the line 5th on race day. Michael Schumacher's teammate Nico Rosberg will start the Italian Grand Prix one position behind in 9th place ahead of Lotus Renault GP driver Bruno Senna. Holding the 62nd Italian Grand Prix on the Formula 1 schedule, the Monza road course will get underway at 2 PM local time (8 AM Eastern time). Weather forecast for Sunday predicts the race will be an affair taking place under a very hot day.